Fits girls approx ages 2-9. Flower halo has curling ribbons attached. Silver tiara also included. Wings measure approx 15" by 14". Butterfly wand comes with ribbons. Tutu has 4 layers and Gerbera flower. Measures approx 12" long. 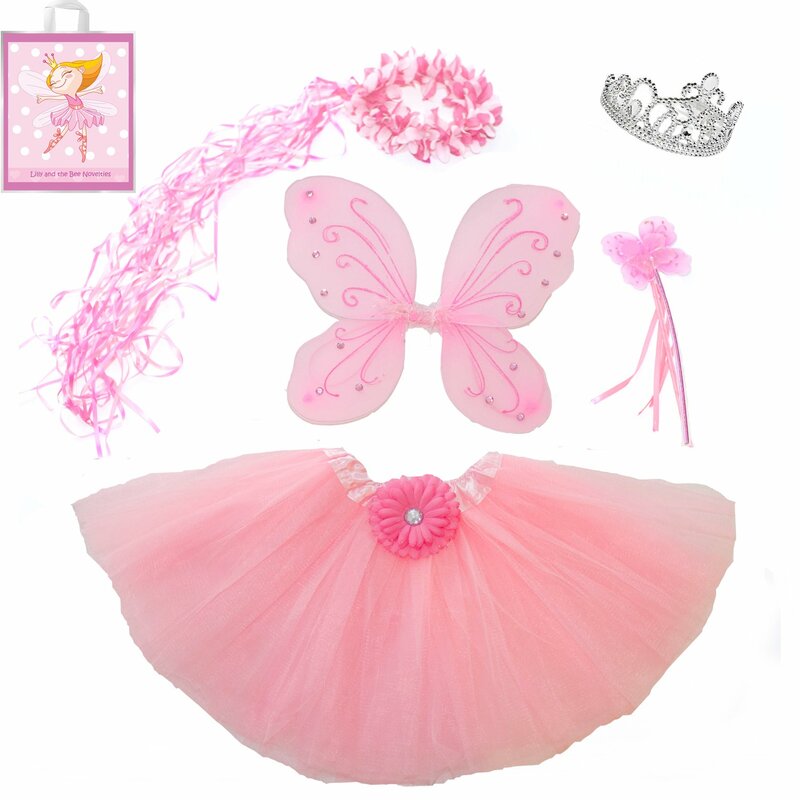 Color: Pink This is the perfect dress up costume for your favorite little Fairy Princess.She will have so much fun in this outfit. The dress up wings, which areembellished with sparkling glitter, are the perfect accessory for your littlefairy or pixie! These wings also have a fluff of feather in the center. Thematching straps are worn over your shoulders. Wings are size 15 x 14 inches.The tutu has four layers and a comfortable stretch satin waist. Halo containsflowers with curling ribbons attached. A silver tiara is also included formore dress up fun. Comes packaged in our exclusive Lilly and the Bee Novelties (TM) reusable bag,adorably decorated with our signature fairy princess on one side and herfairytale friends on the the other side. Our exclusive bag is perfect for giftpackaging this lovely set for your princess. Just add tissue and your set isready to give to your favorite princess. She can reuse this bag for sleepovers, carrying her toys or a grown up purse for hours of fun. Bag is 3milliliters thick, 18 x 15 inches, environmentally safe and made in the USA.Comes with a soft loop handle for easy carrying.